5/32 Ross St Forest Lodge Stylish and Cozy Lifestyle: Conveniently located, this spacious townhouse offers a peaceful and low maintenance lifestyle on the fringe of the inner city. Light and airy interiors are attractively modernized within and outdoor living areas with a leafy outlook. It's only moments from shops and transport, a short stroll to Sydney University, RPA and a quick commute to the CBD. Accommodation: Gourmet kitchen with Caesar stone bench tops, stainless steel appliances, dishwasher and ample cupboard storage. Open plan living/ dining area flowing onto large outdoor decking area, with a leafy garden. Features: • Air Conditioning • Built-In Wardrobes • Close to Schools • Close to Shops • Close to Transport • Garden • Polished Timber Floor • Formal Lounge Shared: From $215/week per person and $225/week per person plus $15/week per person for all bills including internet. Couple: (We will change the bed to a double bed): From $410/week plus $15/week per person for all bills including internet. 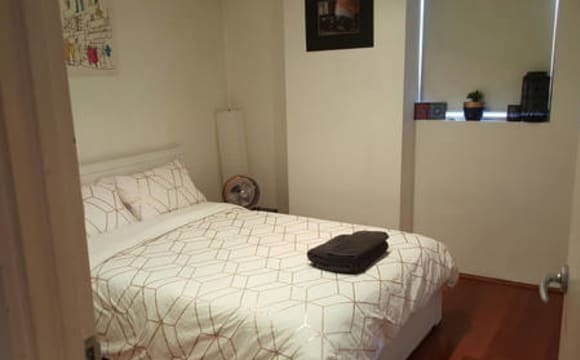 Private: (We will change the bed to a double bed): From $410/week plus $15/week for all bills including internet. (3 MONTHS MINIMUM STAY) Message NOW and hopefully you'll be one of the lucky ones to get a room here!! 6/32 Ross St Forest Lodge Stylish and Cozy Lifestyle: Conveniently located, this spacious townhouse offers a peaceful and low maintenance lifestyle on the fringe of the inner city. Light and airy interiors are attractively modernized within and outdoor living areas with a leafy outlook. It's only moments from shops and transport, a short stroll to Sydney University, RPA and a quick commute to the CBD. Accommodation: Gourmet kitchen with Caesar stone bench tops, stainless steel appliances, dishwasher and ample cupboard storage. Open plan living/ dining area flowing onto large outdoor decking area, with a leafy garden. Features: • Air Conditioning • Built-In Wardrobes • Close to Schools • Close to Shops • Close to Transport • Garden • Polished Timber Floor • Formal Lounge Shared: From $205/week per person plus $15/week per person for all bills including internet. Couple: (We will change the bed to a double bed): From $405/week plus $15/week per person for all bills including internet. Private: (We will change the bed to a double bed): From $405/week plus $15/week for all bills including internet. (3 MONTHS MINIMUM STAY) Message NOW and hopefully you'll be one of the lucky ones to get a room here!! Entertainers Galore on the Fringe of the Inner City in 3/32 Ross St. Forest Lodge! Lifestyle: Conveniently located, this spacious townhouse offers a peaceful and low maintenance lifestyle on the fringe of the inner city. Light and airy interiors are attractively modernized within and outdoor living areas with a leafy outlook. It's only moments from shops and transport, a short stroll to Sydney University, RPA and a quick commute to the CBD. Accommodation: Offering four bedrooms, oversized master bedroom with en-suite, all with built-in wardrobes. Attic style fourth bedroom with skylights and polished timber floors. Updated main bathroom with full bath facilities, internal laundry and additional toilet. Gourmet kitchen with Caesar stone bench tops, stainless steel appliances, dishwasher and ample cupboard storage. Open plan living/ dining area flowing onto large outdoor decking area, with a leafy garden, perfect for entertaining friends and family. All this combined with two secure car spaces. Features: Featuring large bedrooms all with built-in-wardrobes, main with ensuite, modern bathrooms with full bath facilities, gourmet kitchen with stainless steel appliances and dishwasher, open plan living/ dining area flowing onto large leafy outdoor decking area perfect for entertaining, reverse cycle ducted air conditioning, polished timber floorboards and two secure car spaces. Brand new carpet, freshly polished timber floorboards finished in a luxury satin finish and fresh paint throughout. Features: • Air Conditioning • Built-In Wardrobes • Close to Schools • Close to Shops • Close to Transport • Garden • Polished Timber Floor • Formal Lounge • Terrace-Balcony Shared: From $200/week per person per person plus $15/week per person for the bills and internet. Couple: (We will change the bed to a double bed): From $410/week plus $15/week per person for the bills and internet. Private: (We will change the bed to a double bed): From $410/week plus $15/week per person for the bills and internet. (3 MONTHS MINIMUM STAY) Message NOW and hopefully you'll be one of the lucky ones to get a room here!! "Enjoying an elevated position, this stylish and large 2 storey terrace is desirably located moments from the Glebe Village, UTS, Sydney University, R.P.A.H., Newtown and Broadway. - 4 double bedrooms, master opening onto en enclosed balcony - Formal living and dining with timber floor - New kitchen with gas cooking - 2 modern bathrooms - Deep sunny landscaped courtyard, ideal for that outdoor entertaining Simply move in to enjoy the exciting and vibrant lifestyle. Shared: From $195/week plus $15/week per person for the bills and internet. ($210 Total) Couple: (We will change the bed to a double bed): From $375/week plus $30/week for the bills and internet. ($405 Total) Private: (We will change the bed to a double bed): From $365/week plus $15/week per person for the bills and internet. 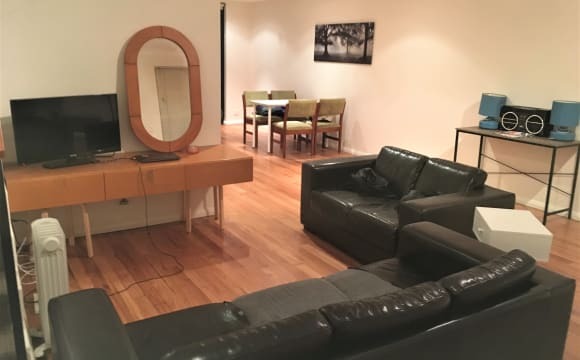 ($380 Total) (3 MONTHS MINIMUM STAY) Why THIS house is too good to ignore… - Join a community - Regular FREE food/drinking events including trips on the harbour, salsa nights and - BBQs across the Cocoon network - Get fit &amp; muscular - Access to any Anytime Fitness gym, 24/7 for FREE - Love your flatmates - Have the final say over who you’ll live with - No fuss - Fully furnished, fully kitted (kitchen items et al) - Professional housing provider - Minimize headaches and find your ideal location - Your house, your rules - Live your own way but have Cocoon assist with issues in the background (if ever needed!) 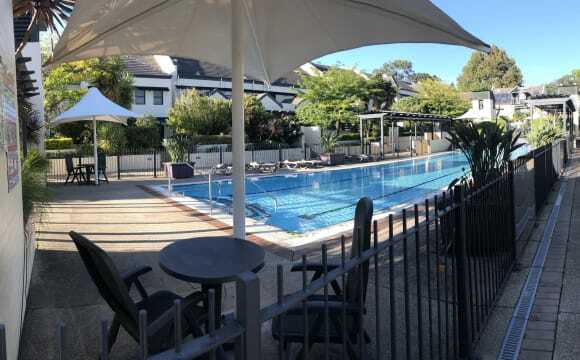 - Protect yourself and your bond - Join a standard NSW Fair Trading lease agreement Message NOW and hopefully you'll be one of the lucky ones to get a room here!!" Hi, we have a room for rent at our awesome place in Forest Lodge Suit a quite, non smoking student or professional. Not a party house but we’re super easy going and hardly ever here.. and we keep the place really clean You’d be sharing with one male personal trainer and one male urban design student.. Nice quiet space, really green, with massive backyard and huge trees Quiet neighbours and could even be pet friendly depending... 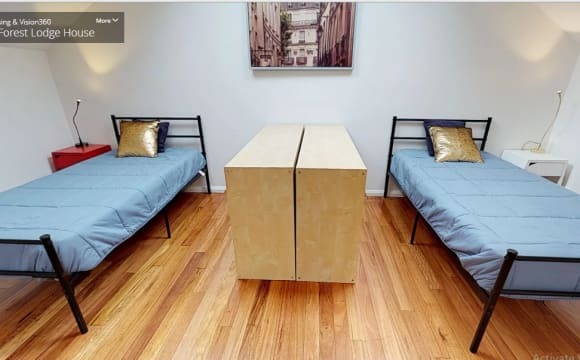 Bus right outside , 5 mins to UTS, TAFE, Sydney uni... Room is fully furnished with queen bed, all new bedding, flat screen, DVD player, table, chest of drawers. Looking for someone to stay a minimum of 6 months , no short term folks please. Room is $195 pw plus $5 unlimited internet pw.. Bond is 4 weeks rent. Room is available now Thanks! Houesplants welcome! Room available in the Flodge Manor. Room must be filled by May 18, can be available earlier if needed. Ideally seeking someone in their mid 20s to early 30s and working full time. We'd love someone who is social and keen for the pub on the weekend but also happy enough doing their own thing. Available bedroom; - only bedroom on the downstairs level so plenty of privacy - built in wardrobes and lots of space - sunny light filled bedroom looking onto the private front garden on a quiet street - airconditioning in bedroom - private bathroom with shower, sink, storage and toilet - bedroom easily fits double bed, two bedsides, desk or chest of drawers - secure front entry to the property - parking available on the street and surrounding block with a permit The house is modern and incredibly spacious with lots of room to relax and enterain. The downstairs level also has a large kitchen area with sit up benchspace and bar stools so you can chat/cook. The kitchen leads into the dining/loungeroom that then extends onto the huge private courtyard. If you're somone with a green thumb and are keen on decorating then the courtyard is your canvas! 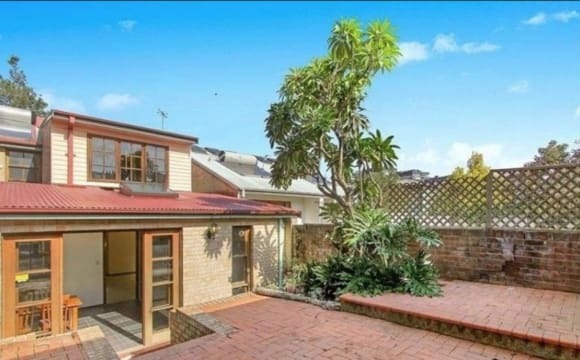 The house is a 5 min walk from Parammatta Rd &amp; Glebe Pt Rd with buses a plenty into the city. 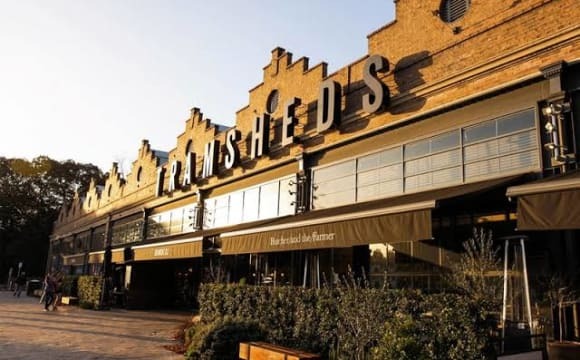 Broadway shops, The Tramsheds &amp; Glebe Foreshore c.15 min walk. Central station &amp; Newtown c.25 min walk. We get a cleaner to come once a fortnight making sure everything is kept neat and tidy in the house so that we've all got more time to Netflix n Chill. 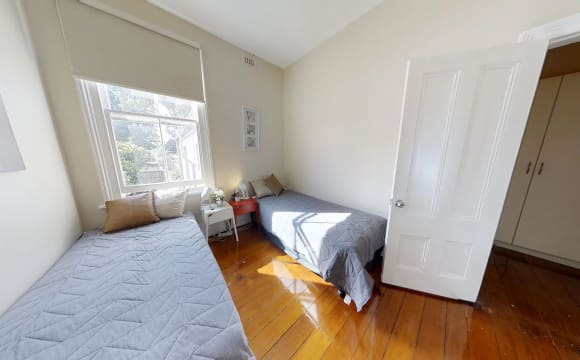 PERFECT UNIVERSITY OF SYDNEY / UTS ACCOMMODATION! ---- ROOMS AVAILABLE OR COMING UP ---- as at Saturday, 20 April 2019 R12 PREMIUM DOUBLE ROOM (DOUBLE BED) Available: NOW Rate (all inclusive) One Person = $360 per week Two Persons = $420 per week -- R1 DELUXE ENSUITE ROOM (DOUBLE BED) Available: NOW Rate (all inclusive) One Person = $400 per week Two Persons = $440 per wek --- R2 DELUXE TWIN/DOUBLE ROOM Available: 23 April 2019 Rate (all inclusive) One Person = $360 per week Two Persons = $420 per week --- R18 PREMIUM SINGLE (WITH BALCONY) Available: 15 May 2019 Rate (all inclusive) One Person = $330 per week --- Please read details below carefully before inquiring -------------------- ZODIAC LODGE A unique Victorian Heritage Building, Zodiac Lodge is a boutique lodge for students, young professionals, and travellers looking for a clean and secure, fully furnished establishment. Family run since 2001. All rooms have been recently renovated. Rooms vary in size - Single, Double, and Twin - for both short and long term stay. Each private room contains quality bed/s, open wardrobes, desk, mirror, TV, fan, and mini-fridge. Shared facilities include: large kitchen (recently renovated), 2 lounge areas, balcony, 6 bathrooms (all with showers, cleaned daily), laundry facilities (coin operated), and clothes drying stations. Rates include: All water/gas/electricity bills. Wi-Fi / daily complementary tea and coffee. Weekly fresh replacement service for towels/linen. Toilet paper, dishwashing/laundry detergents. Daily cleaning of all shared facilities only (not your private room). Building security surveillance. There's also a Breezy Cafe at the front of the building, open 7am-3pm daily. Newly renovated 3 bedroom house in the quiet streets of Forest Lodge. Within walking distance to Glebe Point Road and Parramatta Road, for easy transport to the city or the local restaurants, cafes and bars. Current photos are from when we moved in. Place is fully furnished, except for your bedroom. Ready to move in! Added bonus is free Netflix, Honey, Kombucha, and use of Lloyd's home gym (which he still can't find the time to use!). We're a pretty open-minded bunch and would love someone to share our home with. Hi guys we have a double room to rent in our fully furnished house available NOW We include FREE WIFI and all communal items(washing products/milk/oils etc) House has:- 5 bedrooms Bathroom&amp;shower upstairs Downstairs shower/toilet Courtyard (perfect for bbqs &amp; predrinks) Lounge area Dining table New washing machine &amp; Dryer 1minute walk to all the buses going down Parramatta road and Sydney UNI We are a house of English and Irish working professionals. We are looking for someone who is sociable and tidy We are not a party house but do try to get together for dinners and drinks when we can. If you're interested in the room please send us a message with your name, age, where you're from and tell us a bit about yourself. The bond is $1000 and a weeks rent in advance with 1 month notice moving out. Thanks Guys! Hotel style rooms with secure keypad entry. Unlimited high speed internet, bills included, professionally furnished. Local amenities available within a 5 minute walk include: -	Fantastic local cafes, parks, supermarket, And within a 15 minute walk: - RPA Hospital - University of Sydney - Parramatta Rd - Newtown - The Tramsheds (set of bars and restaurants) - Light rail (Jubilee Park) - Glebe Point Road (great cafes and restaurants) - Various gyms &amp; a pilates studio - Beautiful parks with views of the Anzac Bridge and easy access to Sydney Fish Market - Large shopping centres at Broadway and Leichhardt. Bedroom in pictures is the one which is available, there are large built-ins behind where the photo is taken. It's a newly renovated house, huge living spaces, lots of bathrooms and a large backyard. It also has ducted air-conditioning for the summer! We walk/run to work every morning in the CBD, so it's super close! Whilst the address is on a main street, the house is actually about 40m back from the road behind some apartments (you follow a laneway in to get to it) so it's incredibly quiet! Common areas are furnished. You'll need to supply a bed/mattress, but because of the built-ins you don't need anything else! We have a beautiful brand new fully air conditioned/heated 2bed 2bath apartment with a spare room and bathroom that aren't being used. The spare room is furnished with a queen bed, small cabinet, desk and built in robe, and you would have your own bathroom. We also have high speed internet, Netflix, Stan, Amazon Prime (all the essentials!) which of course you would be able to use. There is no car park available, but there is all day parking available on the street. The apartment is also less than 5min walk from the light rail, Tramsheds (shops &amp; restaurants) and plenty of buses. 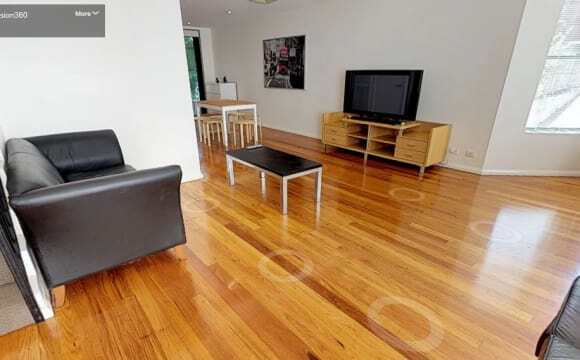 Large furnished room available from Thursday 16 May in Forest Lodge (between Glebe and Camperdown). Room available for minimum 1 month or maximum 1 year. $360/wk (single occupancy only). Bond required. House share with with one other female. Room furnished with queen-sized bed; large desk and chair, chest of drawers, two bedside tables and lamps, large wardrobe - plenty of room for storage. Linen available if required. Facilities: - There is a private off-street parking space available; - Washing machine and dryer, modern kitchen, two fridges, ADSL, TV in living room, shower, bath, paved garden with BBQ; - Electricity, water usage and internet are shared between the two house occupants (allow between $25-30/week). My street nestles in between 4 different bus routes so the house is just a 5 minute walk to public transport. There are pleasant leafy views from the house and the local community is very friendly. Local amenities available within a 5 minute walk include: -	Fantastic local cafes, parks, supermarket, GoGet car share, Bike share. And within a 15 minute walk: - RPA Hospital - University of Sydney - Parramatta Rd - Newtown - The Tramsheds (set of bars and restaurants) - Light rail (Jubilee Park) - Glebe Point Road (great cafes and restaurants) - Various gyms &amp; a pilates studio - Beautiful parks with views of the Anzac Bridge and easy access to Sydney Fish Market - Large shopping centres at Broadway and Leichhardt. My flatmates are moving out and so I have a room available in my gorgeous 2 bed / 2 bath apartment from early May. The room is a large double bedroom with built in wardrobes and a seperate study nook. You will also have the main bathroom (conveniently next to your bedroom) all to yourself. The apartment is large, bright and airy with ducted air conditioning and a big balcony. 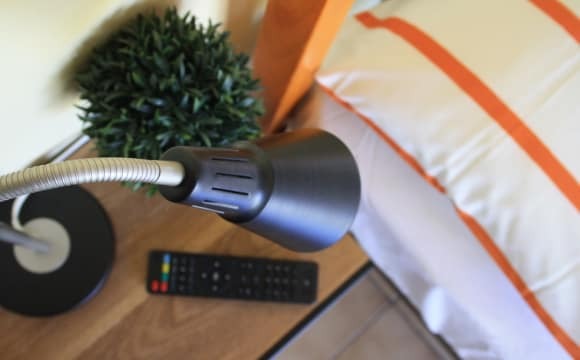 It comes fully furnished (except for your bedroom) with high quality appliances and furniture. It's also nice and high on the 6th floor in one of the apartment buildings in the Harold Park development. The location couldn't be better - close to Jubilee Park light rail stop and buses on Glebe Point Rd and Parramatta Rd. It's next to The Tramsheds (great for Messina gelato lovers!) and walking distance to Glebe Point Rd and Broadway for all your shopping needs. The city is only 3km away so it's great for CBD workers as well. Newly renovated 3 bedroom house in the quiet streets of Forest Lodge. Within walking distance to Glebe Point Road and Parramatta Road, for easy transport to the city or the local restaurants, cafes and bars. Current photos are from when we moved in. Place is fully furnished, except for your bedroom. Ready to move in! Up for rent is a room in a 3 level terrace house on the south end of St Johns Road. Shared with only one other tennant, the house gives each person privacy and their own space, with two floors separating each tennant's rooms. As you can see in the photos, the room is semi-furnished with a desk, bookshelves, small drawers and a large wardrobe and has a plush carpet on the floor. It has a courtyard outside that can only be accessed from the room itself, providing a nice area to sit in dappled afternoon light. 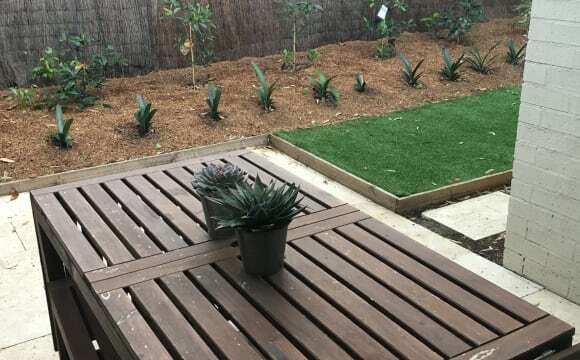 The house also has a backyard with a couple of different areas to sit and relax and place to hang washing. As an academic at USYD, it takes me only 7 minutes to walk to work and the house has a good location close to RPA hospital, UTS, Glebe Pt Rd shops/restaurants Broadway shopping centre and is serviced by plentiful buses in the blocks surrounding. On-street parking is available with a City of Sydney Council parking permit. Bills are not included in the rent with an average cost of about $90 per month each, made up of internet, gas, electricity and water. Rent is paid monthly. The house has all normal items like washing machine, fridge, kitchen appliances and items, microwave and there is a spare heater for use in winter too. 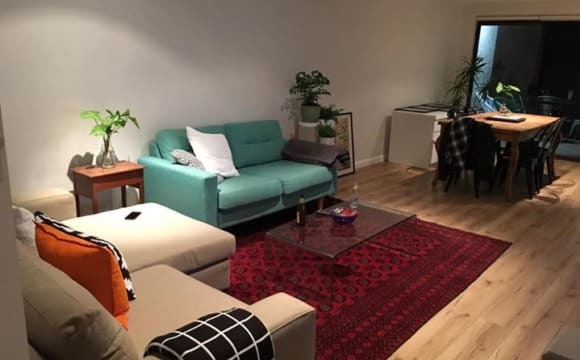 The room would suit a mature aged/postgraduate student or working professional looking to live with someone who is both sociable and appreciative of some quiet time. On weekends the house has an extra four legged tennant - my pup who lives elsewhere during the week due to long working hours. The room is clean and available immediately. 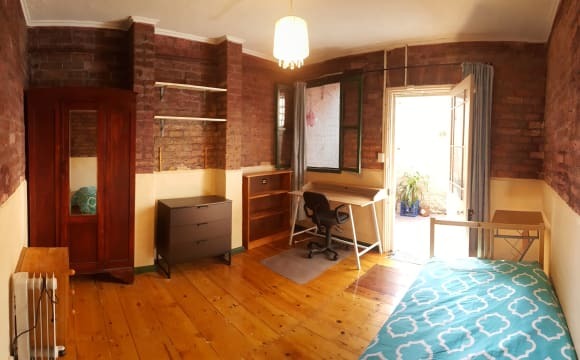 I have been living for last 4 years in an amazing apartment situated close to the corner of St Johns Road and Ross street with a 10 min walk to the Sydney Uni. It's a secured 2 bedroom apartment with intercom, elevator and cycle storage facilities, located very close to the centre of the cafes, bars and restaurants, with a bus stop right outside the door and about a 15 min walk to Broadway shopping centre. The bedroom is a decent sized bedroom, with a bed and comfortable mattress, a three door wardrobe and a bedside table, a fan and a lamp. The bedroom has its own private exit to the courtyards so plenty of light, outdoor furniture and a gas BBQ. The highlight of the place is the massive entertainer's private courtyard perfect for the summer barbies, very spacious air conditioned living room. Very spacious town house, bedroom comes with a chest of draws and built in robe, just need a bed. Open plan living downstairs and 3 bedrooms upstairs. Free flowing living through the kitchen to the dining out to the courtyard and through to the 25m outdoor lap pool. There is a gym downstairs and a big private garage accessed from our flat. All in all a very homey feel to the place. Couples are welcome.